Fancy driving a seven-seater without paying road tax or doing any damage to the oZone? The new Nissan e-NV200 Combi Estate is the only fully-electric car of its type on sale at the moment. For green-minded buyers who need up to seven seats, lots of space and practicality, it’s worth having this on your shortlist. Its great advantage is that it’s borrowed tech from the already tried and trusted EV star, the Nissan Leaf. It’s also based on the Nissan e-Nv200 van, which means it’s robust enough to deal with everything seven people can chuck at it. If you only want an all-electric MPV, it’s pretty much this or nothing else. Is it good enough? 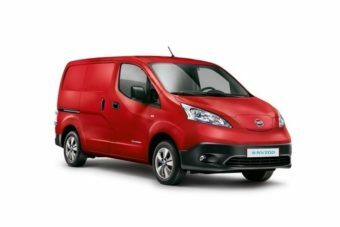 OSV takes a closer look to find out with our 2017 Nissan e-NV200 Combi Estate review. On the road, it doesn’t always feel like an electric car, but that’s more to do with its sheer weight than anything else. Where the much smaller Nissan Leaf is lively, agile and quick to respond if you just cough near the accelerator, the e-NV200 Combi Estate is less responsive. Not only is it the only EV of this type on the road, it’s also the heaviest of all EV’s. As mentioned, the electric motor is taken from the impressive Nissan Leaf. It develops up to 107bhp, which seems super modest for a vehicle of this size. However, from startup it develops a handier 187lb ft of torque. It shares its battery with the Leaf, too, and has an official range of 106 miles. On the move, it isn’t very entertaining. Drivers won’t be wetting their lips in anticipation once they sit themselves down on the upright driver’s seat, and your low expectations are met once you get going. Its cart-sprung rear axle is its biggest problem. With just the two of you inside the vehicle, the back end (free from passenger and luggage) will crash over surfaces and jitter and jerk. On a full load, however, it should be able to cope a lot better. The best thing about driving a van full of people? It’s super quiet and easy to drive in traffic. There is zero diesel clatter, and the absence of a manual gearbox that tires you out as you aim to remain in the torque curve is a huge positive. Top speed is just 76mph. That is less of an issue than it sounds, primarily because you get so much torque. As such, keeping up the traffic is pretty easy, as is changing lanes safely. One last issue is that hotter weather will take its toll on the battery. The more you use the air conditioning, the more power you will sap. Also, the more you use the vehicle on a full load, the more you will put a strain on the battery, too. The e-NV200 Combi Estate is available with either five or seven seats. Adding a third row is obviously great if you need to squeeze more passengers in here, but it’s worth pointing out that adults will find it hard to even get into that third row. Kids, on the other hand, will be just fine. Overall, interior space is good. There is enough legroom to stretch out, and the seats are comfortable. Being based on a van means the quality of the finishes and materials used is questionable, and there is no hiding from its van-based roots. But the cabin has been built to cope with the demands of modern life, and everything is logically arranged. The buttons and dials are easy to locate, and easy to use. It’s far from a posh cabin, and it won’t excite you. But there is a certain beauty to its functionality. The five-seater version is fine if five seats are all you need, and you still get a massive boot in case you need it. However, the seven-seater not only gets more seats than any other fully-electric car on the market, it also comes with a boot that measures 870-litres when all the seats are up. Fold the two rows of rear seats, and you can increase that to 2,940-litres. The boot has no lip, but we’re not too impressed with the lack of storage space inside the car. There really needed to be more cubbies. Just like there are seven seats, there are also seven trim levels to choose from. The names can be a bit confusing – the Rapid and Rapid Plus models sound fast as hell, but they’re named after how fast they can charge a battery. Letdown! In terms of standard kit, all models get twin-sliding doors, rear privacy glass, alloys, as well as air conditioning. 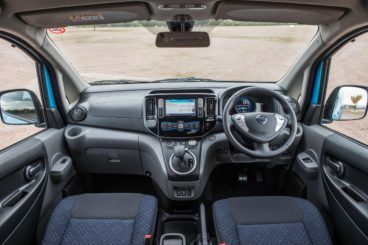 The Acenta Rapid Plus model adds automatic headlights and rain-sensing windscreen wipers, while the Tekna Rapid gets an infotainment system, a four-speaker stereo, a heated steering wheel, and heated front seats. Safety-wise? Euro NCAP gave it a dismal three out of five for its crash test performance, and the car does do without a number of advanced safety features. Lane-departure warning is missing, as is automatic braking. However, it does come with tyre-pressure monitoring, traction control and lots of airbags. Moreover, EV’s are known for their safety and reliability. Prices for the new car start out from £21,380 and rise to £32,250. For more information on our leasing deals, check out our page here. This is an all-electric vehicle, so running costs were always going to be better than your average conventional MPV. Not only is it free from road tax, there will be nothing to pay at all at the filling station. And if you don’t want to fork out up to £27,000 on the seven-seater version, you can reduce it by renting the batteries on the monthly. This will cost you as little as £70 or £130 a month – it all depends on your expected mileage, as well as ownership period. That said, it depreciates badly and will only be worth a fraction of its original price after three years. There is no other all-electric MPV on the market right now. You can stick to the five seats, or you can add two extra for the kids if you wish. If you were worried what an all-electric MPV would be like on the road, just read about the successful Nissan Leaf, whose powertrain and various other techie bits this car shares. It does. We won’t even try to dress this one up. It’s safe and uninspiring on the road, its heavy batteries putting a dent in performance. Still, taxi drivers won’t be complaining about that. The Nissan is the only fully-electric vehicle in this review (and of its type). 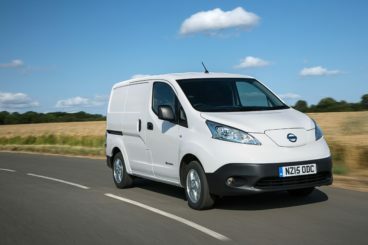 Just in case you’re open to conventional van-based cars, let’s see how it fares against its rivals in the comparison section of our Nissan e-NV200 Combi Estate review. 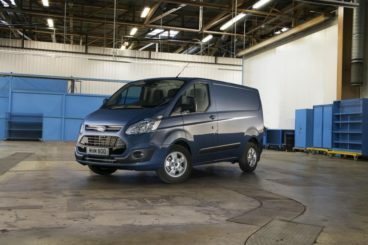 The new Ford Transit Courier Kombi is just one of four different Ford Transits. In 2017, there is a Ford Transit for all occasions. The Transit Courier Kombi is a van-based people carrier that shares its underpinnings with the Fiesta and the Ford B-MAX. As you’d expect, it’s robust and fairly good to drive. Power comes from a turbocharged 1.5-litre diesel engine that develops up to 74bhp. It comes with stop-start tech as an optional extra, which helps to keep running costs low. So while it isn’t all-electric like the Nissan – and therefore won’t be as cheap and as clean – it can return over the 72mpg economy – which is hugely impressive for a vehicle of this size. Without stop-start tech, it still averages a respectable 68.9mpg economy. The engine also comes with the brand’s EasyFuel system on board, which stops you filling the Transit Courier Kombi up with petrol by mistake. Emissions, meanwhile, are just a little over 100g/km of CO2, which means you won’t need to pay too much in road tax each year. It’s a useful engine, one that always feels planted on the road, isn’t too noisy, and offers decent performance. Moreover, the ride quality is supple and the Transit handles with greater fluency than the Nissan. Like the Nissan, the Ford’s cabin is more functional than anything else. Still, its user-friendliness is what makes it such an attractive proposition. Interior space is good, and all the buttons and dials are easy to locate and operate. The vehicle comes with a reach and height adjustable steering wheel, visibility is good up front and in the rear, while the instrument cluster is sharp. The overall quality of the interior is high considering its van origins. Storage space is good, and includes a good-sized glovebox and some big door pockets. The load bay, meanwhile, measures 1,620mm in length. The new Fiat 500L MPW may not be an electric car, but it’s certainly an odd-looking vehicle. It’s part of the 500L family, and not only is it the weird-looking sibling that everyone shuns at parties – it’s also the biggest. Indeed, it’s the Fiat 500L model that has a different genetic makeup to the rest of its family. Far removed from the cute and cheerful 500 Hatchback, this wagon had seven seats, a huge boot and plenty of room for you and your passengers. On the road, OSV’s top pick is the 1.6-litre MultiJet diesel engine. It develops up to 120bhp and feels up to the task of getting a full load from A to B and beyond. A 1.3-litre MultiJet diesel unit, on the other hand, feels a lot less capable and is probably worth overlooking. 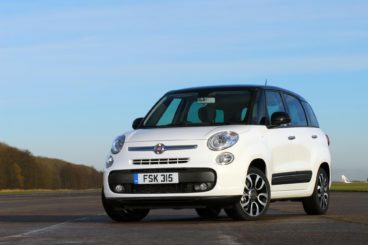 It’s sluggish, and loses breath quickly when your Fiat 500L MPW is full of people. Nether model is what you’d call fun to drive, but we reckon most buyers will be attracted to its safe and predictable nature. Moreover, despite its polarising looks it’s the most compact seven-seater on the market. It fares well on the economy front, too. Like the Ford, it can’t claim to be as frugal and clean as the all-electric Nissan, but the 1.3-litre diesel returns as much as 72.4mg. As mentioned, though, we’d avoid that engine and test the 1.6-litre MultiJet instead. It returns a still-impressive 67.3mpg and offers plenty of power. Inside, the Fiat 500L MPW is nice and comfy, thanks to supportive seats and a soft suspension setup. That said, the five-seater variant offers more comfort, on account of there being fewer seats and people to squeeze in. The extra two seats are for children only, too. The cabin does a good job of keeping wind and road noise out for the most part, but there will be a few whistles and howls at high speeds. The dashboard, meanwhile, is pretty if understated and has the usual Fiat 500L look and feel to it. The boot measures 168-litres with all seven seats up and 493 with all five seats up. Fold both rows, and you can free up 1,509-litres of space. Clean, safe and useful, the new e-NV200 is ideal for environmentally-conscious drivers and families who want to get from A to B without any hassle. It’s versatile, large inside, and is the most practical EV on the market right now. The new Nissan e-NV200 Combi Estate is far from flashy and showy, but it could be the soundest investment you make this year.